Blahoš J., Svoboda Z., Höschl C.: The effect of calcitonine on glucose metabolism. Endokrinologie 68, 1976 ,s.226-230. Höschl C.: Lithium influence on TSH response to TRH in depressed patients. Physiologia Bohemoslovaca, 30, 1981, 1: 89-90. Höschl C.: Effect of lithium on the TRH-test. Activ. nerv. sup., 23, 1981, 4: 276-278. Höschl C, Stárka L, Roth Z, Vokálková J, Jaššová J. A specific laboratory test for primary depression. Acta Univ. Carolinae Medica, 31, 1985, No. 5-6, pp: 347-364. Höschl C., Kožený J.: DST in Czechoslovakia. Biol. Psych., 21, 1986, 11: 1103-1104. Höschl C., Kožený J.: Verapamil in affective disorders: a double-blind, controlled study. Biol. Psychiat., 25, 1989, 2: 128-140. Höschl C.: Do Calcium Antagonists Have a Place in the Treatment of Mood Disorders? Drugs, 42,1991,5: 721-729. Reprinted in: New Ethicals, May 1992: 139-149. Höschl C.: Prediction: Nonsense or Hope? Br.J.Psychiat., 163 (suppl.21), 1993: 46-54. Řípová D, Němcová V, Farská I, Papežová H, Höschl C: Changes in platelet phospholipid content in treated and untreated schizophrenics. Eur.Neuropsychopharmacol. 3 (3), 1993: 395. Řípová D., Němcová V., Růžička P., Strunecká A., Höschl C.: Phosphoinositide-signalling system in resting platelets of schizophrenics. European Neuropsychopharmacology 4, 1994, 3: 372. Řípová D., Němcová V., Strunecká A., Höschl C.: Inositol triphosphate and cytosolic calcium level in activated plate lets of schizophrenics. European Neuropsychopharmacology 4, 1994, 3: 371. David I., Filip V., Höschl C., Libiger J. Karen P.: Possible prediction of therapeutic outcome based on single dose effect of levoprotiline and maprotiline on C-EEG. Homeostasis, 35, 1994, 6: 292-293. Goodwin GM, Nolen WA: Treatment of bipolar depressive mood disorders: Algorithms for pharmacotherapy. (Group: Bourgeois ML, Conti L, Fischer P, Gastpar M, Griffiths JM, Höschl C, Kapitany T, Malt UF, Muscettola G, Papadimitriou GN, Potter WZ, Puzynski S, Swinkels JA, Zarate CA jr.). International journal of Psychiatry in Clinical Practice 1, 1997: S9-S12. Höschl C., Kožený J.: Predicting academic performance of medical students: The first three years. Am. J. Psychiatry, 154, 1997, 6: 87-92. Kožený J., Höschl C.: The temperament and character inventory: psychometric integrity of the Czech version. Studia psychologica 41, 1999, 2:123-132. Řípová D., Strunecká A., Platilová V., Höschl C.: Phosphoinositide signalling system in platelets of schizophrenic patients and the effect of neuroleptic therapy. Prostaglandins, Leukotrienes and Essential Fatty Acids, 61, 1999, 2:125-129. Horáček J., Kuzmiaková M., Höschl C., Anděl M., Bahbouh R.: The relationship between central serotonergic activity and insulin sensitivity in healthy volunteers. Psychoneuroendocrinology 24/1999:785-797. Höschl C., Libiger J.: Rights and responsibilities of the psychiatric profession: Limits of Psychiatry. Psychiatrie 3, 1999, 4:288-289. Höschl C., Libiger J. Rights and responsibilities of the psychiatric profession. Acta Psychiatrica Scandinavica 101, 2000, Suppl. 3999:40-41. Höschl C.: Introduction (Editorial). In: Dose M., Höschl C. (eds): Movement disorders in psychiatry, specifically to drug-induced dyskynesias. Pharmacopsychiatry 33, 2000, S1, pp. 1 – 48. Thieme, Stuttgart – New York 2000. ISSN 0936-9589. Horáček J., Libiger J., Höschl C., Borzová K., Hendrychová, I. Clozapine-induced concordant agranulocytosis in monozygotic twins. Int. J. Psychiatry in Clin. Pract., 5, 2001:71-73. Höschl C., Hájek T.: Hippocampal damage mediated by corticosteroids – a neuropsychiatric research challenge. Eur. Arch. Psychiatry Clin Neurosci 2001, 251:Supp.2,II/81-II/88. Hájek T., Pašková B., Janovská D., Bahbouh R., Hájek P., Libiger J., Höschl C.: Higher prevalence of antibodies to borrelia burgdorferi in psychiatric patients than in healthy subjects. Am J Psychiatry 2002 Feb.; 159(2):297-301. Balon R., Höschl C.: Research training in the Czech Republic. Academic Psychiatry 26; 2002, 2:125-127. Kopeček M., Höschl C., Hájek T. Regional selectivity of novel antipsychotics. Br. J. Psychiat. 181,2002, 9:254-255. Höschl C.: Commercial-academic interface: The need for ethical standards. Mental Health Reforms, 8, 2003; 1:6-7. Grunze H., Kasper S., Goodwin G., Bowden Ch., Baldwin D., Licht R.W., Vieta E., Möller H.J., WFSBP Task force on Treatment Guidelines for Bipolar Disorders (C. Höschl, member of task force): The World Federation of Societies of Biological Psychiatry (WFSBP) Guidelines for Biological Treatment of Bipolar Disorders, Part II: Treatment of Mania. World J Biol Psychiatry, 4;2003, 5:5-13. Horáček J., Bubeníková V., Kopeček M., Brunovský M., Páleníček T., Höschl C.: From animal models to clinical treatment modalities in schizophrenia. Eur. Neuropsychopharmacology, 13, 2003, Suppl. 4:S158. Řípová D., Platilová V., Strunecká A., Jirák R., Höschl C.: Alterations in Calcium Homeostasis as Biological Marker for Mild Alzheimer´s Disease? Physiol. Res. 2004, 53:449-452. Grunze H., Kasper S., Goodwin G., Bowden Ch., Möller HJ. WFSBP Task force on Treatment Guidelines for Bipolar Disorders (C. Höschl, member of task force): The World Federation of Societies of Biological Psychiatry (WFSBP) Guidelines for Biological Treatment of Bipolar Disorders, Part III: Maintenance Treatment. reatment Guidelines for bipolar disorders). World J Biol. Psychiatry, 2004, 5, 120-135. Höschl C.: Atypical antipsychotics in the treatment of schizophrenia. Advanced approaches to atypical antipsychotic tratment. Fujisawa, Japonsko, 2004, str. 1-4. Horáček J., Kopeček M., Španiel F., Mohr P., Dockery C., Seifertová D., Bělohlávek O., Höschl C.: Resting regional brain metabolism in patients with schizophrenia. 18FDG PET study. (Klidový regionální metabolizmus mozku u pacientů se schizofrení. Studie 18FDG PET). Psychiatrie, 8, 2004, S3:43-50. Höschl C., Praško J.: Management of depressed patients with sexual dysfunction. WPA Bulletin on Depression, 2004; 9, 28:11-14. Bubeníková V., Horáček J., Kožený J., Platilová V., Závěšická V., Höschl C.: The effect of tryptophan depletion on the action of haloperidol in MK-801 trated rats. European Journal of Pharmacology, 2004, Vol. 502; 1-2:109-116. Praško J., Horáček J., Záleský R., Kopeček M., Novák T., Pašková B., Škrdlantová L., Bělohlávek O., Höschl C.: The change of regional brain metabolism (18FDG PET) in panic disorder during the treatment with cognitive behavioral therapy or antidepressants. Neuroendocrinology Letters 2004; 25(5):340-348. Horáček J., Závěšická L., Tintěra J., Dockery C., Platilová V., Kopeček M., Španiel F., Bubeníková V., Höschl C.: The effect of tryptophan depletion on brain activation measured by fMRI during the Stroop test in healthy subjects. Physiological Research, 2005, 54:235-244. Höschl C.: Helsinki Ministerial Conference – National Perspectives. Die Psychiatrie, 2005, 2:111-113. ISSN 1614-4864. Španiel F., Herynek V., Hájek T., Dezortová M., Horáček J., Hájek M., Kožený J., Dockery C., Höschl C.: Magnetic resonance relaxometry in monozygotic twins discordant and concordant for schizophrenia. 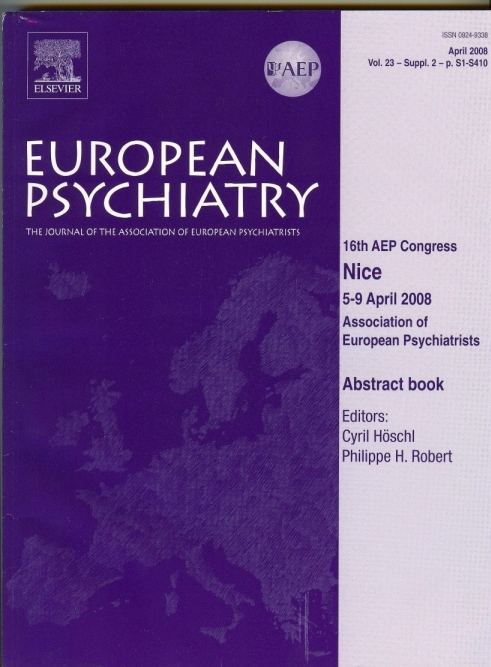 European Psychiatry, 20, 2005, 1:41-44. Hájek T., Libiger J., Janovská D., Hájek P., Alda M., Höschl C.: Clinical and demographic characteristics of psychiatric patients seropositive for Borrelia burgdorferi. European Psychiatry, 21, 2006, 2:118-122. Hájek T., Kopeček M., Preiss M., Alda M., Höschl C.: Prospective study of hippocampal volume and function in human subjects treated with corticosteroids. 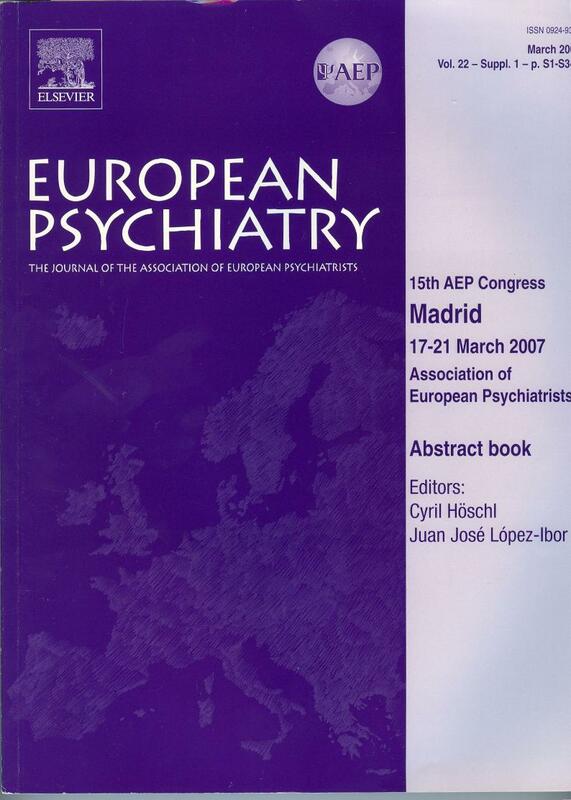 European psychiatry, 21, 2006, 2:123-128. Kopeček M., Brunovský M., Novák T., Tišlerová B., Horáček J., Höschl C.: The effect of cerebellar repetitive transcranial magnetic stimulation on electrical brain acitivity detected by low resolution electromagnetic tomography. Psychiatrie, 10, 2006; S3:54-58. Praško J, Dockery C, Horáček J, Houbová P., Kosová J., Klaschka J., Pašková B., Prašková H., Seifertová D., Záleský R., Höschl C. Moclobemide and cognitive behavioral therapy in the treatment of social phobia. Neuroendocrinology Lett. 27, 2006;4:473-481. Horáček J., Dockery C., Kopeček M., Španiel F., Novák T., Tišlerová B., Klírová M., Páleníček T., Höschl C.: regional brain metabolism as the predictor of performance on the Trail making Test in schizoprenia. A 18FDG PET covariation study. Neuroendocrinology Letters, 27; 2006, 5:587-594. Höschl C. Psychiatric diagnosis and classification from the European perspective. (Diskussions-forum). Die Psychiatrie, 2007, 2:113-115. ISSN 1614-4864. Motlová L, Spaniel F, Höschl C, Balon R. Are There Any Differences in the Efficacy among Second Generation Antipsychotics in the Treatment of Schizophrenia and Related Disorders? Ann Clin Psychiatry. 2007 Apr-Jun;19(2):133-43. Spaniel F, Tintera J, Hajek T, Horacek J, Dezortova M, Hajek M, Dockery C, Kozeny J, Höschl C. Language lateralization in monozygotic twins discordant and concordant for schizophrenia. A functional MRI pilot study. Eur Psychiatry. 22, 2007; 5:319-322. Španiel F, Novák T, Motlová L, Hrdlička J, Höschl C: Information Technology Aided Relapse Prevention Program in Schizophrenia (ITAREPS): reliability and validity of the early warning signs questionnaire. Psychiatrie, 11, 2007; 3:157-159. Spaniel F, Vohlídka P, Hrdlička J, Kožený J, Novák T, Motlová L, Cermák J, Bednařík J, Novák D, Höschl C. ITAREPS: Information Technology Aided Relapse Prevention Programme in Schizophrenia. Schizophr Res. 2008 Jan;98(1-3):312-7. Hájek T., Kožený J., Kopeček M., Alda M., Höschl C.: Reduced subgenual cingulate volumes in mood disorders: a meta-analysis. J Psychiatry Neurosci 2008; 33, 2:91-99. Höschl C., Švestka J.: Escitalopram for the treatment of major depression and anxiety disorders. Expert Rev. Neurotherapeutics 8, 2008; 4:537-552. ISSN 1473-7175. Bubeníková-Valešová V, Horáček J, Vrajová M, Höschl C. Models of schizophrenia in humans and animals based on inhibition of NMDA receptors, Neurosci. Biobehav. Rev..2008, 32:1014-1023. Tandon R, Belmaker RH, Gattaz WF, Lopez-Ibor JJ Jr, Okasha A, Singh B, Stein DJ,Olie JP, Fleischhacker WW, Moeller HJ.World Psychiatric Association Pharmacopsychiatry Section statement on comparative effectiveness of antipsychotics in the treatment of schizophrenia.Schizophr Res. 2008;100(1-3):20-38. Závěšická L., Brunovský M., Horáček J., Matoušek M., Šóš P., Krajča V., Höschl C. Trazodone improves the results of cognitive behavioural therapy of primary insomnia in non-depressed patients. Neuroendocrinology Letters 2008; 29:6. Höschl C. European psychiatry: needs, challenges and structures. Eur Arch Psychiatry Clin Neurosci (2009) 259 (Suppl 2):S119-S122. Horáček J, Španiel F, Novák T, Brunovský M, Minárik M, Mohr P, Páleníček T, Bubeníková-Valešová V, Vrajová M, Höschl C. The influence of polymorphism for gene RGS4 (Regulator of G-protein signaling 4) on regional brain metabolism (18FDG PET) and phenotypic variables in schizoprenia. Psychiatrie, 13, 2009; S3:141-145. Bares M, Brunovsky M, Novak T, Kopecek M, Stopkova P, Sos P, Krajca V, Höschl C.The change of prefrontal QEEG theta cordance as a predictor of response to bupropion treatment in patients who had failed to respond to previous antidepressant treatments. Eur Neuropsychopharmacol. (2010) 20: 459–466. Kopřivová J, Congedo M, Horáček J, Praško J, Raszka M, Brunovský M, Kohútová B, Höschl C. EEG source analysis in obsessive-compulsive disorder. Clin Neurophysiol. 2011 Sep;122(9):1735-43. Horáček J, Flegr J, Tintěra J, Verebova K, Španiel F, Novák T, Brunovský M, Bubeníková-Valešová V, Holub D, Páleníček T, Höschl C. Latent toxoplasmosis reduces gray matter density in schizophrenia but not in controls: Voxel-based-morphometry (VBM) study. World J Biol Psychiatry. 2012 Oct;13(7):501-9. Epub 2011 May 23. Hájek T, Kopeček M, Höschl C. Reduced hippocampal volumes in healthy carriers of brain-derived neurotrophic factor Val66Met polymorphism: Meta-analysis. World J Biol Psychiatry. 2012 Mar;13(3):178-87. Horacek J,Tejkalova H, Novak T, Bubenikova-Valesova V, Palenicek T, Rambousek L, Ruzickova S, Vaculin S, Höschl C. The influence of a subanaesthetic dose of ketamine on circulating pro-inflammatory cytokines and serotonin in brain reply. Psychological Medicine (2011), 41: 1787-1789. Höschl C, Fialová L. European Psychiatric Association guidance on the conflicts of interest. European Psychiatry 27 (2012): 142–146. Baghai TC. et al. General and comparative efficacy and effectiveness of antidepressants in the acute treatment of depressive disorders: a report by the WPA section of pharmacopsychiatry. Eur Arch Psychiatry Clin Neurosci. 2011 Nov; 261 Suppl 3:207-45. Möller HJ, Bitter I, Bobes J, Fountoulakis K, Höschl C, Kasper S. Position statement of the European Psychiatric Association (EPA) on the value of antidepressants in the treatment of unipolar depression.Eur Psychiatry, 2012 Feb;27(2):114-28. Hajek T, Kopecek M, Höschl C, Alda M. Smaller hippocampal volumes in patients with bipolar disorder are masked by exposure to lithium: a meta-analysis. J Psychiatry Neurosci, 37; 2012, 3:1-11. Mohr P, Höschl C, Volavka J. Teaching critical appraisal of articles on psychopharmacology. Acad Psychiatry. 2012 Mar 1;36(2):114-7. Hajek T, Cullis J, Novak T, Kopecek M, Höschl C, Blagdon R, O'Donovan C, Bauer M, Young LT, Macqueen G, Alda M. Hippocampal volumes in bipolar disorders: opposing effects of illness burden and lithium treatment. Bipolar Disord. 2012 May;14(3):261-270. Spaniel F, Hrdlička J, Novák T, Kožený J, Höschl C, Mohr P, Motlová LB. Effectiveness of the Information Technology-Aided Program of Relapse Prevention in Schizophrenia (ITAREPS): A Randomized, Controlled, Double-Blind Study. J Psychiatr Pract. 2012 Jul;18(4):269-80. Höschl C, Winkler P, Pěč O. The state of psychiatry in the Czech Republic. Int Rev Psychiatry. 2012 Aug;24(4):278-85. Fountoulakis KN, Hoschl C, Kasper S, Lopez-Ibor J, Möller HJ. The media and intellectuals' response to medical publications: the antidepressants' case. Ann Gen Psychiatry. 2013 Apr 12;12(1):11. Bauer M et al. ; World Federation of Societies of Biological Psychiatry. Task Force on Unipolar Depressive Disorders. World Federation of Societies of Biological Psychiatry (WFSBP) guidelines for biological treatment of unipolar depressive disorders, part 1: update 2013 on the acute and continuation treatment of unipolar depressive disorders. World J Biol Psychiatry. 2013 Jul;14(5):334-85. doi: 10. Kožený J., Tišanská L., Höschl C.: Assessing empathy among Czech medical students: a cross-sectional study. Československá psychologie, 57; 2013, 3:246-254. Stein DJ, Ahokas A, Márquez MS, Höschl C, Oh KS, Jarema M, Avedisova AS, Albarran C, Olivier V. Agomelatine in generalized anxiety disorder: an active comparator and placebo-controlled study. J Clin Psychiatry. 2014 Apr;75(4):362-368. doi: 10.4088/JCP.13m08433. Horacek J, Mikolas P, Tintera J, Novak T, Palenicek T, Brunovsky M, Höschl C, Alda M. Sad mood induction has an opposite effect on amygdala response to emotional stimuli in euthymic patients with bipolar disorder and healthy controls. J Psychiatry Neurosci. 2015 Mar;40(2):134-42. Bhugra D, Ventriglio A, Kuzman MR, Ikkos G, Hermans MH, Falkai P, Fiorillo A, Musalek M, Hoschl C, Dales J, Beezhold J, Rössler W, Racetovic G, Gaebel W. EPA guidance on the role and responsibilities of psychiatrists. Eur Psychiatry. 2015 Mar;30(3):417-422. Hajek T, Cooke C, Kopecek M, Novak T, Hoschl C, Alda M. Using structural MRI to identify individuals at genetic risk for bipolar disorders: a 2-cohort, machine learning study. J Psychiatry Neurosci. 2015 Apr 8;40(2):140-142. Spaniel F, Novak T, Bankovska Motlova L, Capkova J, Slovakova A, Trancik P, Matejka M, Höschl C. Psychiatrist's adherence: a new factor in relapse prevention of schizophrenia. A randomized controlled study on relapse control through telemedicine system. J Psychiatr Ment Health Nurs. 2015 Dec;22(10):811-820. doi: 10.1111/jpm.12251. [Epub ahead of print] PubMed PMID: 26176646. Bares M, Novak T, Brunovsky M, Kopecek M, Höschl C. The Comparison of Effectiveness of Various Potential Predictors of Response to Treatment With SSRIs in Patients With Depressive Disorder. J Nerv Ment Dis. 2017 Aug;205(8):618-626. doi: 10.1097/NMD.0000000000000574. Krzak AM, Cao JJL, Agius M, Hoschl C. Does neurogenesis relate to depression and do antidepressants affect neurogenesis? Psychiatr Danub. 2017 Sep;29(Suppl 3):241-246. Lehmann I., Chisholm D., Hinkov H., Höschl C., Kapócs G., Kurimay T., Lecic-Tosevski D., Nakov V., Réthelyi J.M., Winkler P., Zielasek J. & Gaebel W. DEVELOPMENT OF QUALITY INDICATORS FOR MENTAL HEALTHCARE IN THE DANUBE REGION. Psychiatria Danubina, 2018; Vol. 30, No. 2, pp 197-206.